Students, would you like the opportunity to sing on stage during Syracuse Stage’s production of “The Christians” this spring? Special Auditions for students will be held on Monday, Oct. 12, at Syracuse Stage. More information can be found below. To schedule an appointment, call Chris Botek at 315-443-4008. Prior experience performing on stage is not required. Participants will receive Syracuse Stage tickets, access to a professional rehearsal process, opportunities to mingle with professional cast members and other artists from around the country, and the chance to be part of a unique and inspiring production of an award-winning American play produced by the region’s leading professional theater. Do you have the courage to change your heart? Pastor Paul is much loved and respected, but he has a difficult sermon to deliver. What will be the impact of his words on his loyal congregation? What will be the consequences for his family? For himself? Playwright-to-watch Lucas Hnath invites people of all faiths and beliefs to engage in a conversation about the seemingly insurmountable distance between us. 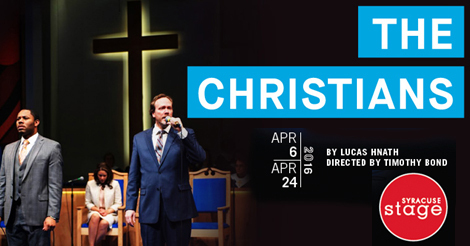 Set in a contemporary mega-church and performed as a Sunday service with sermons, scripture and a full choir, “The Christians” has quickly become one of the most-talked-about new plays in the country. Audition Requirements: Community choir candidates should prepare one stanza of “Amazing Grace” to perform a cappella.